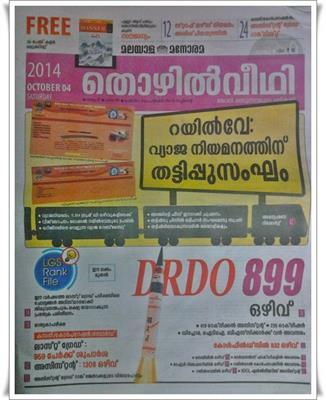 Malayala Manorama Thozhilveedhi, the most prominent employment newspaper has published its 4th October issue. The most recent edition of 'Thozhilveedhi' is fully packed with rising vacancies and job opportunities in various fields. In the 4th October issue of Thozhilveedhi, vacancies in DRDO, Coalfields, SAIL, Ordinance Factory, Mangalore Refinery, Railway Corporation, Railtel Corporation, Railway and IOCL are reported. While going through the pages, readers can find new job prospects like 899 in DRDO, 45 in Loksabha, 70 Officers in Bobcards, 832 in Coalfields, 55 in Mangalore Refineries, 50 Field Supervisors in Railtel Corporation, vacancies in SAIL, 55 in Ordinance Factory, 74 Engineering Assistants IOCL have found place in the current edition of Thozhilveedhi. Fresh opening in M G University, Agricultural University and Kannur University are also given in the 4th October edition. LGS Rank File prepared by Lakshya Thiruvanathapuram, LP/UP,HAS & Pre Primary/Nursery Teachers Question Paper prepared by Florence Academy Anchal would gudie the students are having their final preparation for the exam. Interviews and success tips given by Rank holders of Assistant Grade exam is the main attraction of the 4th October 2014 issue. Articles on various topics including Railway fake website and Reserve Conductor are eye openers for the readers. Regular columns like Open Forum, PSC for Beginners, Syllabus of various upcoming Kerala PSC exams and Hall Ticket details are also featured in the latest issue. Doubts put forward by the readers are also cleared by concerned PSC officers. The current issue of Thozhilveedhi can be utilized to get extra mileage in the exam. Thozhilveedhi is accompanied by 'Competitive Winner', a free booklet which contains the latest General Knowledge in capsule format. This miniature general knowledge text has already proved to be a companion for young job seeks to grab their dream job. More than an employment magazine, 'Thozhilveedhi' is an exclusive platform for youngsters and enlightened them to know more and build an impressive career.